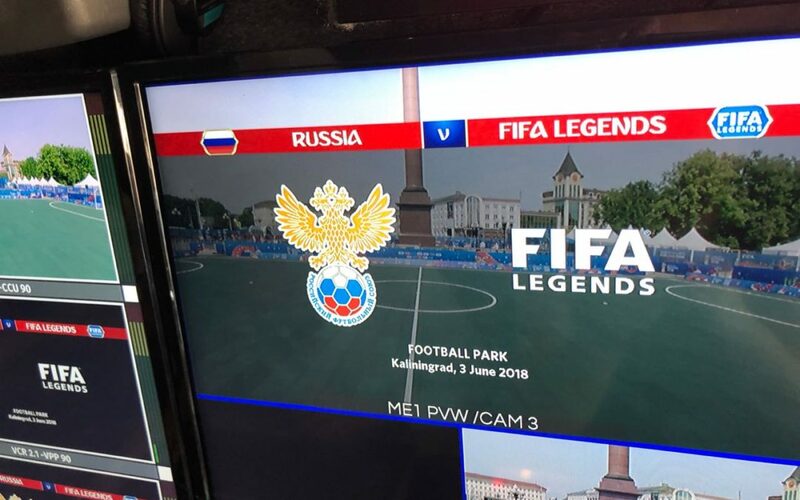 Berlin, Germany – Ruptly provided original multi-camera live transmission of the pre – World Cup match with FIFA and Russian football legends in five different languages. The friendly game took place in Kaliningrad on June 3 and featured Brazil’s double World Cup winning captain Cafu, as well as Nwankwo Kanu, Nuno Gomes, Wes Brown, Niko Kranjcar and Pascal Zuberbuehler. The team was up against Ruslan Nigmatulin, Dmitry Sennikov, Andrey Fedkov,Dmitry Khlestov, Andrey Tikhonov and Aleksandr Panov. A 4K OB van, equipped with Riedel’s Mediornet video router, Bolero wireless intercom and Arri’s Amira cameras has been utilised for an hour of uninterrupted multi-camera live broadcast, delivered to international clients and social media platforms in five languages by professional sports commentators. Throughout the World Cup, Ruptly is offering broadcast services with three outdoor multi-camera studios in Moscow, Saint Petersburg, and Sochi, in addition to live stand-up positions in 11 host cities. Ruptly’s extensive coverage includes all World Cup events, pre-match trainings, exclusive interviews, fan zones, and viral videos from every host city in Russia. Using “Ruptly Stringer”, a UGC app, the agency is able to source and provide the best user-generated videos in real time. Ruptly expects a minimum of four World Cup live transmissions a day via the “Ruptly LIVE” platform, which enables users to broadcast up to nine simultaneous events to multiple destinations, including direct to social media. Direct social media streams require no additional specialist technology on the user side, making it possible to gain access to lives in as little as three clicks. Along with state-of-the-art live solutions, Ruptly’s team operates drones and uses 360-degree cameras for video and live coverage. A complete overview of the World Cup coverage and the technology used will be presented at the IBC Show in Amsterdam in September. Ruptly is a global multimedia agency launched in 2013. Today its materials are used by more than 1,000 media companies from 89 countries — from major TV channels to online projects and mobile platforms. Ruptly videos have appeared on air and online for news outlets such as CNN, NBC, CBS, and VICE. Ruptly was awarded the Drum Online Media award for “Best B2B News Site” in 2017, “Commercial Team of the Year” in 2018 and its project Ruptly LIVE became a finalist of both The Drum Online Media Awards and Global Media Innovator.